Because of Israel’s Law of return, many a Neanderthal from Eastern Europe found refuge in the glorious Jewish Homeland. In over 50% of the cases, their own ‘Jewishnesss’ is questionable, yet they are now attempting to bring us back to the 19th century. Often, because of their base of support they get themselves elected to our Knesset. One such ‘throwback’ is a man called Avigdor Liberman, a man who not too long ago advocated the execution of any Arab MP that communicated with Hamas. Israel has always prided itself on the ‘fact’ that Israeli Arabs have equal status as Israeli Jews. I have said before and will say it again… that is a crock of bull! I’m not surprised by the Arab Knesset members’ refusal to sign a letter by Knesset Speaker Dalia Itzik calling on parliament speakers across the world to do their utmost in an effort to elicit a sign of life from the kidnapped IDF soldiers. This is a symptom of the helplessness displayed by the State of Israel, its legal system, and even its legislature in the face of an effort to undermine the foundations of the Jewish-democratic state, undertaken through the utilization of our liberal democracy and political culture. The State of Israel is home to a significant population sector whose identity stems from an aspiration to bring about the State of Israel’s destruction. This group has succeeded in turning the values of democracy against itself, as a sort of self-destruct mechanism. This group’s members accept Israeli citizenship but their loyalty lies with another people. They support Hizbullah and Hamas, but are willing to receive medical treatment and social insurance payments from the State when they’re hurt in attacks by the very same terror groups. They take part in elections but send to the Knesset members whose job is to undermine it. The Arab community’s elected officials are not the root of the problem, but rather, its display window. The root of the problem is that same father whose two children were killed by a Katyusha rocket in Nazareth, yet he still blamed the government of Israel and characterized Nasrallah as a “great leader” and “dear brother,” right before approaching the National Insurance Institute to receive compensation granted to victims of hostile acts. The country has the right to defend itself and its Jewish-democratic character. A bill I submitted to the Knesset immediately after the elections requires that every citizen, at the time of receiving his or her Israeli identity card, pledge their allegiance to the country as a Jewish and democratic state, to the national anthem, and to the principles outlined in the charter of independence. Also, every Israeli must obligate to perform national service – either military or a civilian alternative. Anyone who refuses to sign such declaration is welcome to remain a permanent resident with full rights, with the exception of the right to elect and be elected. As to those Knesset members, there’s a dual gap – both when it comes to legislation and to enforcing current laws. According to the Basic Law: Knesset, a Knesset candidate whose goals or acts include: A) Rejection of the existence of the State of Israel as a Jewish and democratic state, B) Racism, C) Support for an armed struggle by an enemy state or a terror organization against the State of Israel, will be barred from running for Knesset. Despite repeated attempts, the Central Elections Committee never disqualified a candidate on the basis of clauses A or C. What’s worse, our laws do not include a clause forbidding such activity on the part of a serving Knesset member. The second bill submitted by the Israel Our Home faction in the last Knesset session is supposed to provide a response to this problem, with a Knesset member who violates those clauses having his term curbed immediately. The relationship between the State of Israel and its minorities is currently at a crossroads. The Arab community must decide where its loyalties lie – to those who are willing to live in the state of the Jews as a loyal minority with full rights and obligations I say “Welcome”. 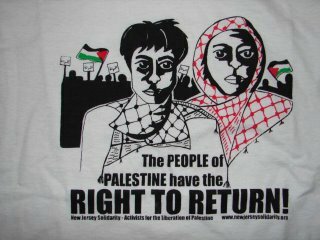 To those who tied their fate to that of the Palestinian people I say that this country may be too small for both of us. The Real Solution would be to recognise a State of Palestine… allow them to have a Right of Return… and let them map out their own destiny…. without interference from the dark ages.